Learn how to use ethical and scientifically proven principles of persuasion to convince your audience. More than 30 years ago, Robert Cialdini wrote the book Influence: The Psychology of Persuasion. In it, he explores identifies six principles of persuasion: reciprocity, commitment, consensus, liking, authority and scarcity. Those principles can be mighty useful when building the case for an investment in risk management. 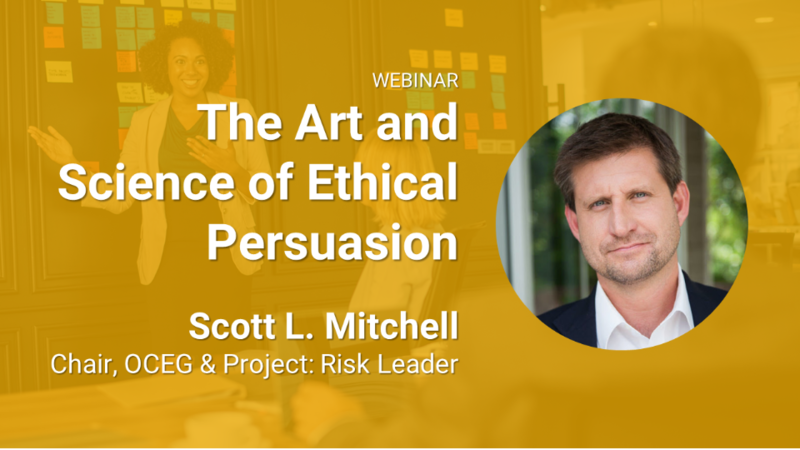 Join Scott Mitchell, chairman of OCEG and the Risk Leader Advisory Board as he walks through the 6 (plus 1 bonus) Principles of Persuasion. What kind of help do you need in the near future? A link to the archive was sent to . Make sure the email arrives in your inbox: either add "support@projectriskleader.com" as a safe sender to your email platform, or if you use Gmail, drag our email into your Primary tab.